T he Valiant (SNV-2) two-seat trainer was manufactured by Vultee Aircraft with a wing span of 42 feet and a length of 30 feet. The wood air frame was covered with fabric or plywood and the two ton plane was powered by a Pratt and Whitney 450 HP radial engine. The Valiant sank in Lake Washington, not far from Denny Park, on February 29, 1944. The incident occurred during a routine training flight with Lt. Carter Perry flying and Instructor L.S. Nitka in the back seat. The engine began to falter and the pair attempted to bring the aircraft in for an emergency landing at the Sand Point Naval Air Station. They overshot the runway, so powered up to make another approach when the engine died completely and they were forced to ditch the plane in the lake. Both the pilot and instructor made it out of the plane safely, which then sank into the cold, dark water and was never recovered. Robert Meister later (~1990) located the Valiant lying upside down on the silty bottom in 120 feet of water, due North of the Sand Point runway. Diving the wreck of the Valiant today is quite a treat. 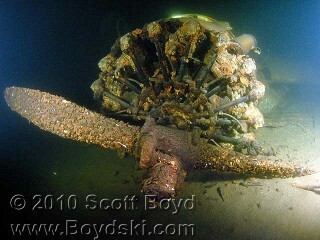 It is rare to see a wood framed airplane wreck that is in such good condition. Much of the fabric or plywood skin is deteriorating with patchwork holes, but the airframe looks solid and the radial engine is remarkable. The wings are lying on the mud, with the landing gear pointing straight up. The tail section is slightly twisted, with the rudder laying in the silt and the stabilizer and tail wheel very intriguing. This particular wreck is very, very fragile and should not be touched by divers as even an errant fin kick can damage the fragile skin. Shot lines or anchors should NEVER be dropped directly on the plane. Please drop them at least 50’ to the North of the wreck, where you will find a nice guideline to help you locate this wonderful bit of history. 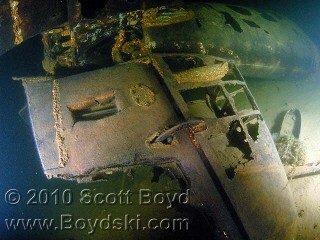 Additional underwater photos of the Valiant SNV-2 can be found by clicking on the thumbnail images below.